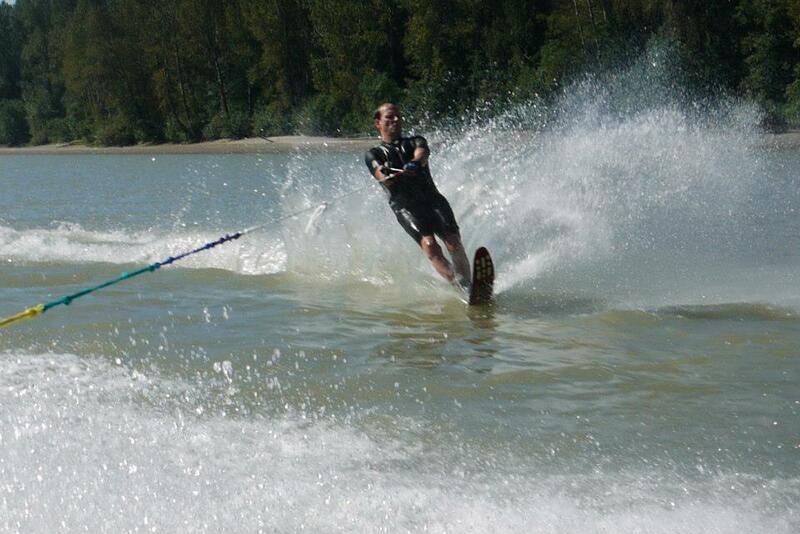 I love slalom skiing. Wakeboarding is fine. We even surf behind the ski boat these days. There is something, however, I love about that feeling of creating a big rooster tail, feeling the rhythm, living in that moment. I don’t own a boat (I whine about that here sometimes) but I have a good friend who will, if I pout enough, take me for a ski every now and then. 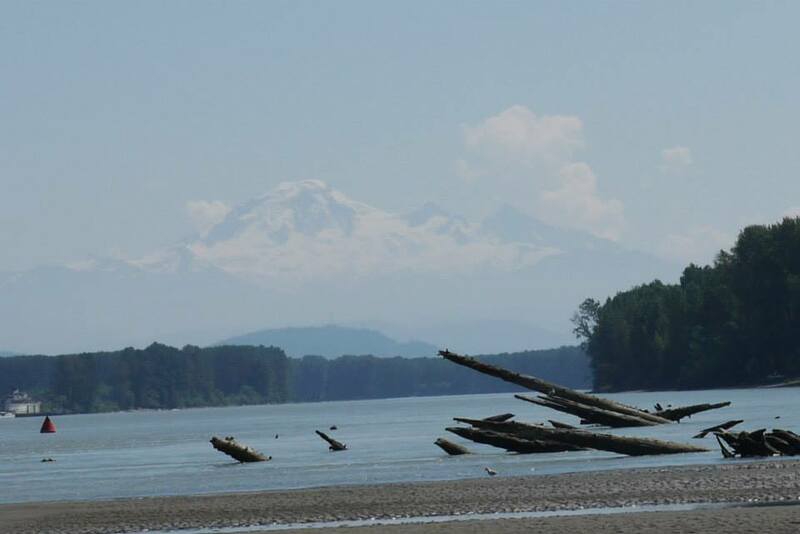 This past long weekend we launched the boat on the Fraser River and took a cruise towards Vancouver, had lunch on Rempel Island… and I got out the ski. Something happens to me when I water ski that rarely happens in the real world. I can truly, for a few brief moments, live in the moment. I’m not thinking about the mortgage or my problems, I don’t even care about my family or my finances. All I want to do is cross the wake and lean. I’m not a great slalom skier but I am a decent one and so I don’t have to think much about falling or screwing up. I just “am”. About a month ago we went skiing on Alouette Lake during an overnight campout with two of my kids, my ski boat buddy Rod, and a lifelong friend Martin. We woke up Sunday morning and soon realized that no one, not a single person, was on the entire twelve-mile long lake. I put on the ski and dipped into the 72 degree water. Within seconds I was up and began the rhythm, the poetry that is slalom skiing. I was alone on a lake surrounded by mountains on all four sides, the water was glass and warm. I was fully alive. I wish more of my life was like those moments. Too much of life is lived looking forward or backwards, worrying about stuff and people and problems, trying to make a living while wishing I was in Rod’s boat. Life has a way of taking up most of our time. Few of us are rich enough to spend our life waterskiing. It’s tempting, isn’t it, to pine for that which we do not have and miss out on the blessings we should enjoy. Mindfulness. In counseling I talk about it all the time but often fail to live it myself. Mindfulness is allowing yourself to be in the moment, enjoy the journey, and appreciate what is happening right now. We are a discontented people who have been raised with champagne wishes and caviar dreams; never satisfied and constantly stressed. I got a little Pelican kayak for my birthday last week from some good friends and family who know me enough to realize that I need to paddle something. For most of my life I have been passionate about whitewater canoeing. I have canoed the Nahanni, the Clearwater River, the Foster River, the Muskeg River, several rivers in Colorado and northern Canada. I’ve done the Kootenay River four times now with my boys, my brother, my dad and my best friends from Alberta. When I dream of canoeing I dream of the Churchill River, of Great Devil Rapids, of wrapping a canoe around a rock on Donaldson Chamber with my old friend Don Hand. Paddling is in my blood and I have tried to instil that love in my three boys. Floating down Otter Rapids in your life jacket is something everyone should do at least once in their life. I have memories of friends and moments, so many moments, that will stick with me for life. My happy places – rivers and lakes and slalom skis and Rod’s boat. I am trying to live other moments as well. Moments at work, playing with Angus, kissing the people I adore, talking with friends, playing in the band. It’s tempting, isn’t it, to forget to enjoy what is happening at this very moment and dream of times long past or dreams to come. Mindfulness reminds me to smile right now, even on dry land. I’m still going to paddle my new kayak out to Rempel Island this week. Ahhh, ‘Zen’. Like your analogy of finding zen on dry land. Every time I read a post of yours Scott I can relate on some level; this time it is the water, Allouette Lake, the Fraser. We probably pass each other on the street. Its funny, it used to blow me away to be talking to someone 1/2 way across the world. Now I am taken back when I find out a blog I follow is based right in my back yard. This summer I bought (or are buying) a little cabin on Hatzic Lake; I have befriended people who own a party barge and are kind enough to include me almost every evening when they cruise the lake and swim off the boat. I love to watch the Heron, the Eagles soar and catch fish, for the first time in my life I saw a Kingfisher dive into the lake and come up with a fish. I am so blessed, you are so blessed to live where we live. Lakes, rivers, mountains surround us in every direction. Oh I saw a guy wakeboarding for the first time this summer; that is unreal! Blew me away to see them doing it. I’ve never managed to get up with 2 skies let alone one or done!! OMG! That is so funny! Did you grow up here? I was raised in Chilliwack. Lived in Mission 12 years ago and just moved back a couple of years ago.